The University of Arizona’s etc…Educational Theatre Company in Tucson will produce a play “Red Ridin’ in the Hood and Dos Cuentos” based on three stories from my award-winning children’s book, “Red Ridin’ in the Hood and Other Cuentos,” a retelling of traditional fairy tales with Latino characters and culture. The etc… production will feature The Piper of Harmonía, a retelling of the Pied Piper with lizards; Blanca Nieves y los Siete Vaqueritos, the Snow White story set in old Mexico and told by puppets; and Red Ridin’ in the Hood, set in a modern day barrio where Roja is not at all fooled by a wolf in a low-rider. Tour dates in Arizona are Oct. 12, 19, 26 and Nov. 2, 9, 16, 30. 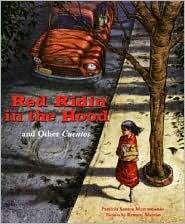 “Red Ridin’ in the Hood and Other Cuentos,” published by Farrar, Straus and Giroux, New York, won the 2007 Anne Izard Storyteller’s Choice Award, was named a Commended Title by Americas Award for Children’s and Young Adult Literature, and earned a Starred review from the American Library Association and Best Collections to Share, 2005 Wilde Awards.